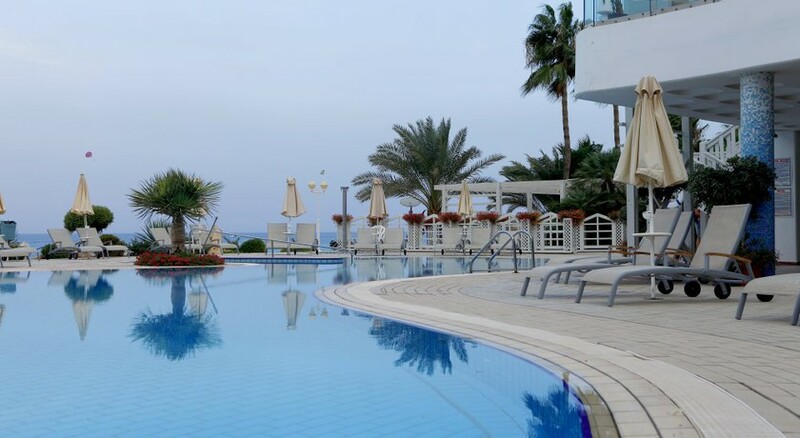 Thanks to its seafront location, the Sunrise Beach Hotel in Protaras is a paradise for beach lovers, where you can hop between the hotel’s lagoon style pool and the sea in a few steps. Protaras’ main beach is also a few steps away, where you’ll find a clutch of authentic bars. The hotel’s dine-around programme is one the main attractions, with various choice of restaurants in the area serving the likes of American, Asian, Italian and Greek cuisine. 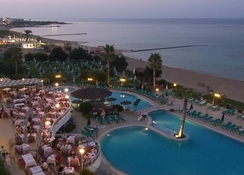 Sunrise Beach Hotel in Protaras is a purpose-built resort for the beach and sun lovers on the south-eastern coast of Cyprus. The real draw of the resort is the scenic walks on the sandy beaches, which blankets the rugged coastline. You’ll find a few lively bars and restaurants right on the main street, catering to everyone’s taste. Additionally, the clubs and bars of Ayia Napa are just a 10-minute taxi or bus-ride away. The rooms of the hotel come with a balcony and air-conditioning. You can upgrade your room to a twin room to have a sea view. 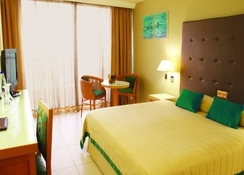 There’re family rooms for those staying with kids, a superior upgrade is also available. But if you’re looking for panoramic views of the beach and ocean, then opt for extra special, superior junior suites with two balconies. The hotel boasts a couple of restaurants to choose from. One of the main restaurant serves a mixture of Mediterranean cosines, while the others serve an assortment of international buffet dishes. But if you’re looking for an a la carte dining, American diner serves amazing seafood. 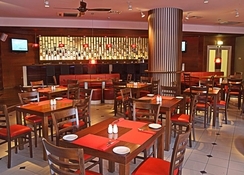 There’re three bistros on Protaras’ main strip, serving Greek, Asian and Italian cuisine. Othello lounge bar is a must try that comes with a lively nightly programs like live singing acts, live instrument acts, dance shows and magic. Relax in the hotel's extensive gardens designed to enhance the beauty of the natural environment. The hotel’s lagoon style pool with whirlpool & swim-up bar is completely at your pleasure. There’s a Health Club that offers a host of facilities including an indoor heated swimming pool, a fitness gym, sauna, steam bath, whirlpool as well as beauty centre. Additionally, the hotel’s water sports centre has something for everyone. Experience the sea is a new way – soak in some exotic sea view from a Paraglider, Sail along the coast on a Windsurfer, or for more excitement, try a Jet Ski ride. The hotel’s kids’ playground and mini-club is well-designed to keep your little ones happily occupied.